Walking right into police headquarters, the old man walked up a flight of stairs to the chiefs office where he sat down and began to tell an incredible story. Perhaps more amazing than the story he told though was the fact Gonzales was 101-years-old at the time. The old chief told Keno Wilson how he arrived in San Diego and how he became a lawman in 1838. To enhance his credibility, Gonzales had papers proving his story of being San Diego’s first lawman. As Wilson sat listening to the story he probably couldn’t help but being struck by the fact if not for the long gray beard on the old mans face, he barely looked 70-years-old. Gonzales said the reason he came back to town was to report being robbed at his ranch in Baja California. The two men talked for several hours and, as much as Wilson may have wanted to help, there was simply nothing that could be done as the crime had taken place in Mexico. Realizing the significance of the event, Wilson called in Captain Bartholomew Moriority and the two men posed for pictures with the old chief. After having his picture taken, the aged lawman then thanked the two officers and started walking north to his son who owned a ranch in the north county. He was never seen again. Antonio Gonzales was born to Mexican parents in Calcutta India in 1810. At 12-years-old he was hired as a cook aboard a sailing ship and traveled the world. In 1838 he came to San Diego on the ship Maria where he fell in love with the small town and decided to call it home. It didn’t take long before Gonzales realized there was a pressing need for law enforcement. As a frontier town, duels, fights and murders were common as soldiers battled drifters who battled anyone else. After several months of witnessing the lawlessness, Gonzales rounded up eight vigilantes, formed a small police force and appointed himself chief. The force was informal, loosely organized and unpaid. As was the custom around the west coast of what is now the United States, the lawmen wore no uniforms or badges. The population decline reached bottom in 1840 when there were only 140 people living in town. For the next several years a power struggle ensued with battles fought throughout the state over who would ultimately control California. In 1842 San Diego was shook up when Mexico, fearing a revolution like the one going on in Texas, ordered 500 convicts released from prisons with orders to head north. Weeks later, the men arrived in town naked and dirty and set about turning the place upside down. Nothing seemed to be safe as the convicts stole whatever they could get their hands on. Fortunately for law-abiding citizens, the men did not stay as the small police force chased them out of town. As Americans began to arrive in town in the mid 1840’s, Gonzales went south to Mexico where he set up a ranch. It would be more than half a century before San Diego would see him again. 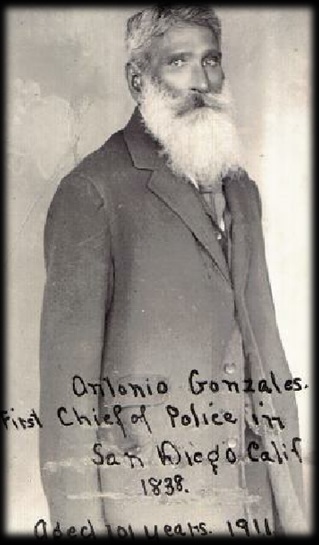 On June 20, 1911, more than sixty years after leaving Old Town and the arrival of the white man in San Diego, Antonio Gonzales came back.